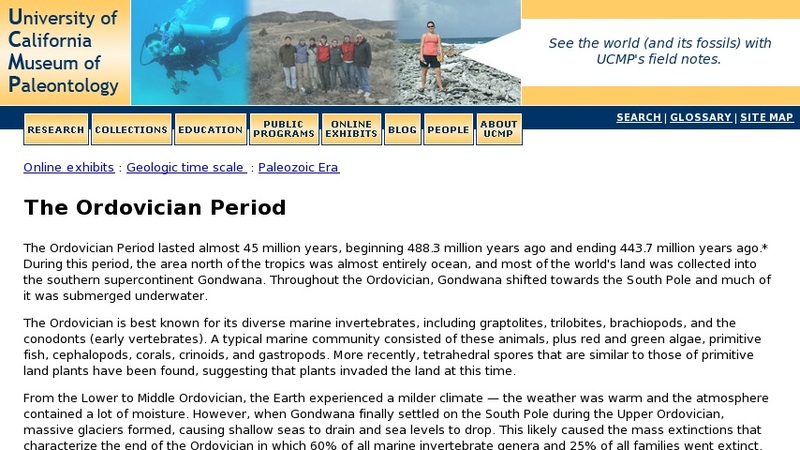 This site describes the Ordovician period, which is best known for its diverse marine invertebrates, including graptolites, trilobites, brachiopods, and the conodonts (early vertebrates). A typical marine community consisted of these animals, plus red and green algae, primitive fish, cephalopods, corals, crinoids, and gastropods. The tectonics segment describes Gondwana, discusses the northwards drift of the Baltoscandian Plate, and provides information on the Ashgillian glaciation. The stratigraphy page notes that the period begins with the presence of dictyonemid graptolities and ends with the appearance of Parakidograptus acuminatus. A page about the lifeforms of the Ordovician discusses the conodonts and ostracoderms, and the location page features the Lake Winnipeg algal flora.